Find out whether RX Vega was worth the wait. After months of teases and delays, the wait for Vega is finally over. First, AMD launched its flagship Radeon RX 64 lineup: the $499 Radeon RX Vega 64 and the $699 liquid-cooled Radeon RX Vega 64, which is only available as part of a convoluted “Radeon Aqua Pack” bundle. (Update: After the initial wave of availability, virtually all available air-cooled Radeon RX Vega 64 cards are only available in $599 Radeon Packs as well.) Then on August 28, the $399 Radeon RX Vega 56 hit the streets. 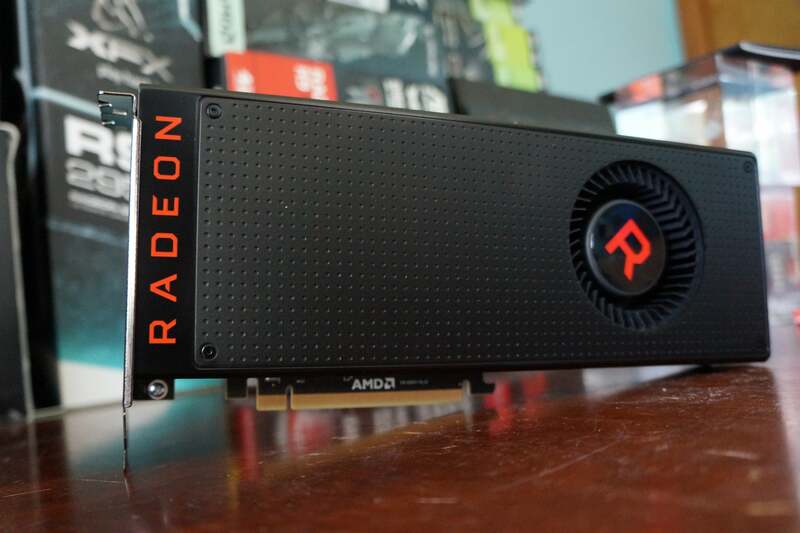 And for the first time in a long time—over a year, in fact—the Red Team is fielding high-end graphics cards capable of challenging Nvidia’s enthusiast-class hardware. These are the first high-end Radeon chips built using the 14nm technology process, following in the footsteps of AMD’s mainstream-focused Polaris graphics cards. Does Radeon RX Vega wrest the performance crown from the ferocious GeForce GTX 1080 Ti? Spoiler alert: Not even close. But Vega provides an intriguing—and sometimes compelling—alternative to the GTX 1070 and GTX 1080, even if it isn’t the walk-off home run that AMD enthusiasts have been hoping for ever since Radeon marketing took a swipe at Nvidia’s next-gen Volta graphics architecture eight long months ago. This won’t be a short review. We’re introducing AMD’s new Vega graphics architecture as well as testing three different Radeon RX Vega graphics cards based on that architecture. You can use the table of contents bar to the left to warp to the sections you’re most interested in. 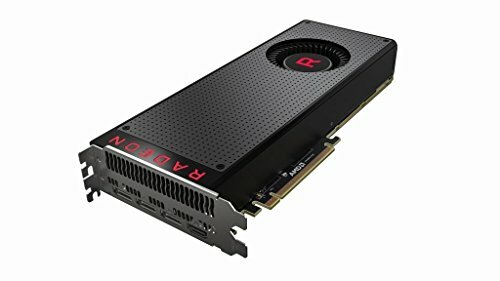 This review was originally published on August 14, 2017 with Vega 64's arrival but was updated with more information for Vega 56's August 28 launch. 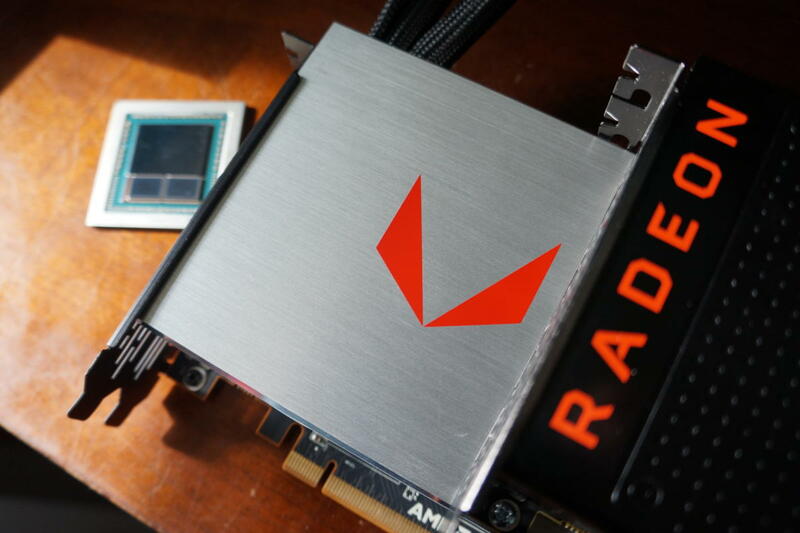 AMD sent PCWorld every version of Vega for testing, including both the air-cooled and liquid-cooled versions of the Radeon RX Vega 64. While the design and cooling obviously differ, the two models share the same underlying hardware. The water-cooled Vega 64 hits higher clock speeds (and thus higher levels of performance) thanks to its embrace of liquid, but unfortunately we can’t recommend it. The card sure looks pretty but it disappoints on pretty much every other front, doubly so because it’s available only in a pricey $699 “Radeon Aqua Pack” edition. We'll get into the details through the review, or you can cut straight to the chase in our Buying Advice section. Vega 64’s technology mirrors that of the Fiji GPU found inside older Radeon Fury X in many ways. Both GPUs pack 4,096 steam processors, with 64 compute units (hence the name), 256 texture units, and 64 ROPs. 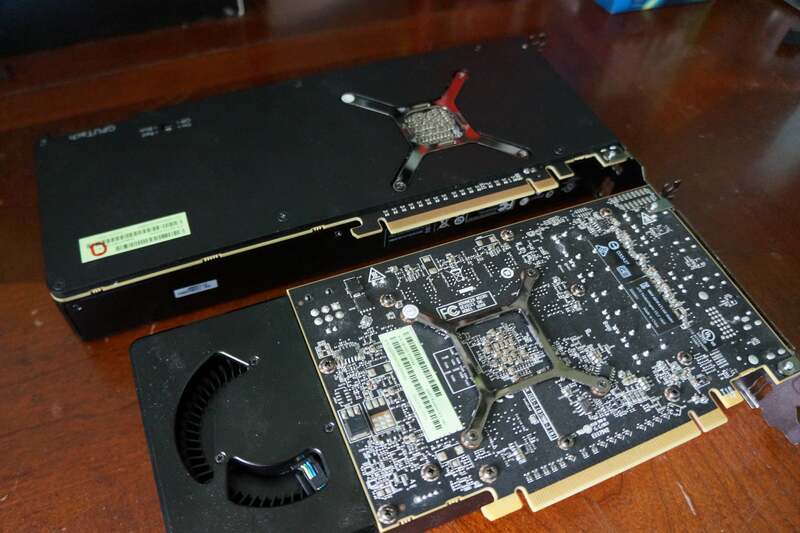 Likewise, the Radeon RX Vega 56’s innards resemble those of the Fury X’s similarly cut-down sibling, the Radeon Fury. But the compute units inside Vega are “next-gen CUs”—more on that and other deep-level tech later—and Vega distinguishes itself in more obvious ways, too. 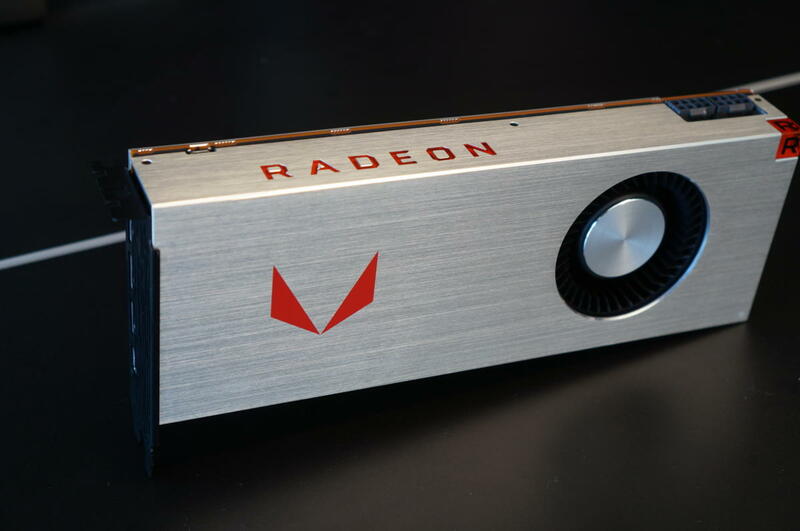 The Radeon Technologies Group tuned Vega to run at far higher clock speeds than its predecessor. 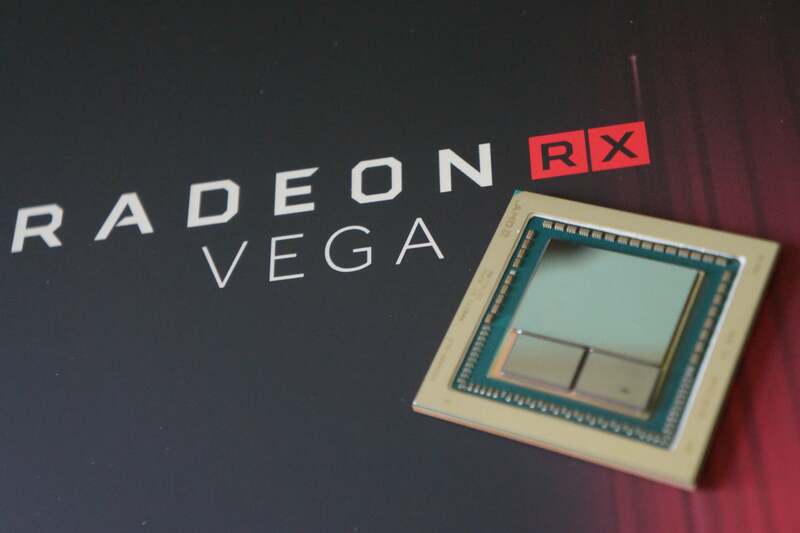 While the Fury cards hovered around 1,000MHz, the air-cooled RX Vega 64 baselines at 1,247MHz, with a rated boost clock speed of 1,546MHz. The liquid-cooled version pushes that even further, to 1,406MHz base and 1,677MHz boost. Vega 56, meanwhile, bottoms out at 1,156MHz and boosts to 1,471MHz—or potentially more. 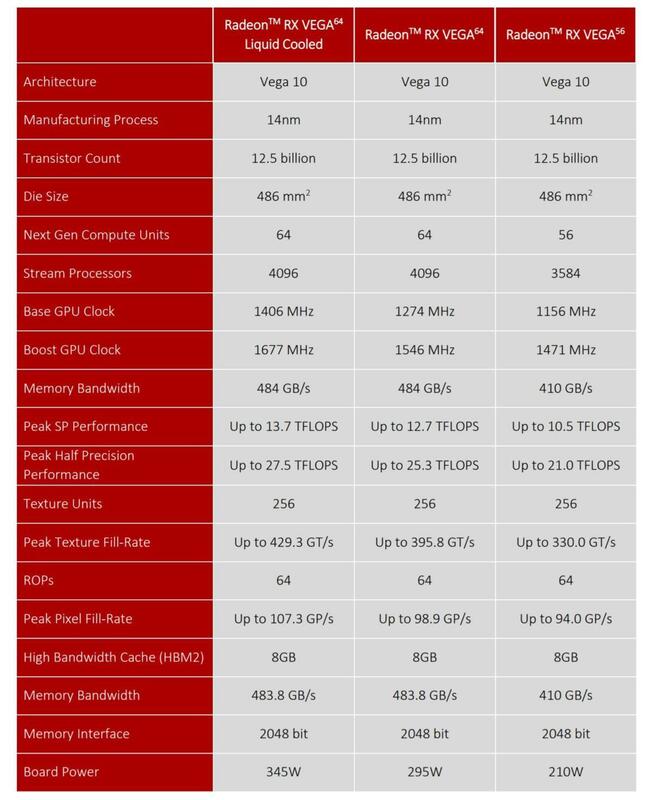 While the boost clocks of previous Radeon cards were a hard maximum, AMD is mimicking Nvidia’s methodology for Vega. 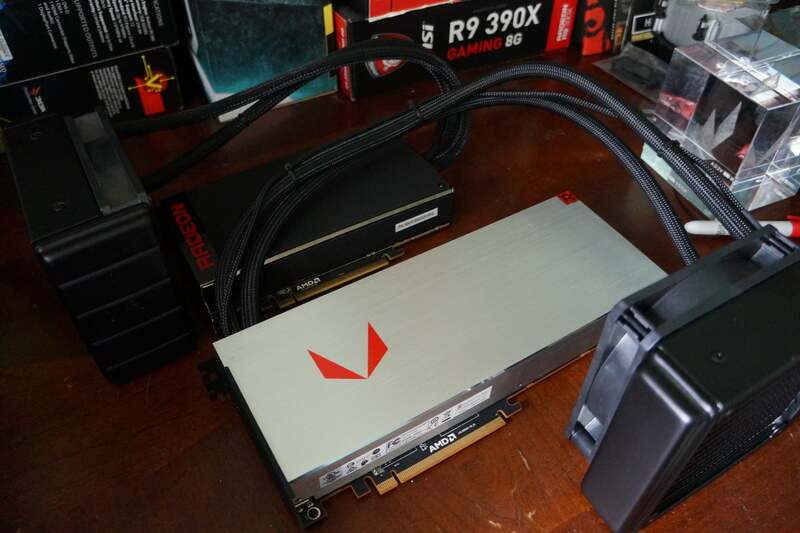 The listed boost clocks for the Radeon RX Vega 56 and 64 “represents the typical average clock speed one might see while gaming” now, to quote AMD’s reviewer’s guide. Groovy. Vega’s memory capabilities took a turn for the better, too. Like the older Fury cards, Vega uses cutting-edge high-bandwidth memory. But while the Fury cards utilized first-gen HBM that was limited to 4GB of capacity—and can now struggle in some high-end games because of it—the Radeon RX Vega lineup leans on a more advanced HBM2 design with 8GB of onboard memory. At 484GBps, RX Vega 64’s memory bandwidth is actually slightly less than the Fury X’s total (it hit 512GBps) due to the use of fewer HBM stacks on-die, but still far ahead of the GTX 1080’s 320GBps via 8GB of GDDR5X memory. The 11GB GeForce GTX 1080 Ti offers identical memory bandwidth to Vega 64, while Vega 56 is slightly slower at 410GBps. With 8GB of HBM2 you’re unlikely to hit a memory bottleneck anytime soon—that’s doubly true thanks to an innovative new feature enabled by Vega’s high-bandwidth cache controller. Again, more on Vega’s big new tech features later. 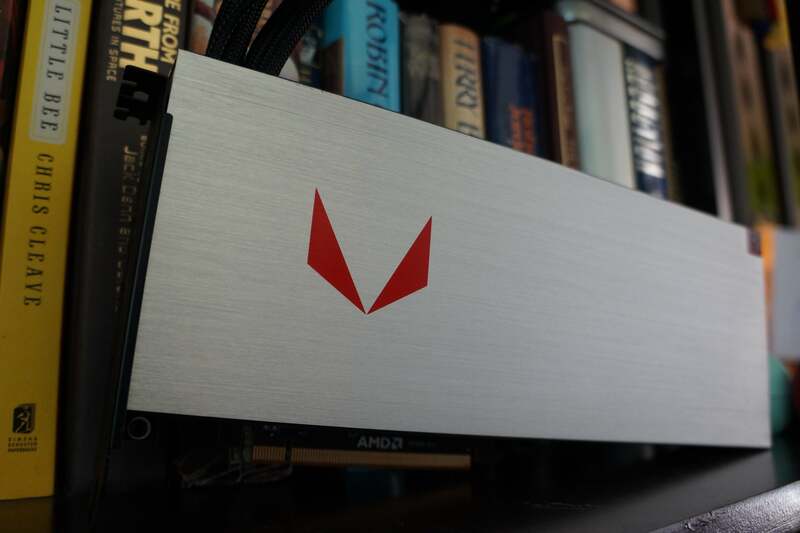 The air-cooled Radeon RX Vega 64 will be available in two forms: a basic version that looks like the reference versions of the Radeon RX 400/500-series Polaris graphics cards, only longer, and a Limited Edition with a brushed aluminum exterior. Limited Edition cards will be sold only to initial RX Vega 64 buyers until supplies last, and AMD wouldn’t say how many are being produced. All Vega cards include a backplate. We’re reviewing the standard models but snagged a pic of the Limited Edition at AMD’s Vega announcement at Siggraph. The Radeon RX Vega 56 looks similar to the standard RX Vega 64. While they both mime the Polaris reference cards at a quick glance, the Vega cards are longer (despite using space-saving HBM2 memory) and ditch Polaris’s plastic shell for sturdier metal materials, including a backplate. 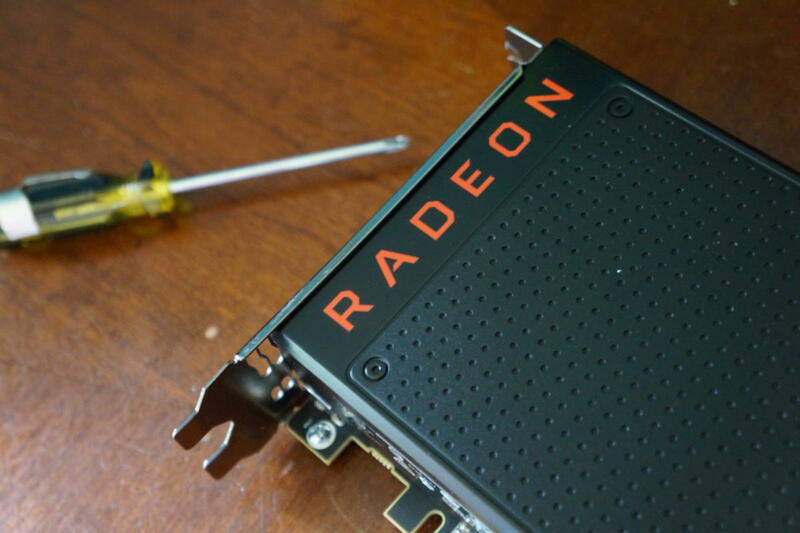 The Radeon logo on the side edge of Vega cards glows red. 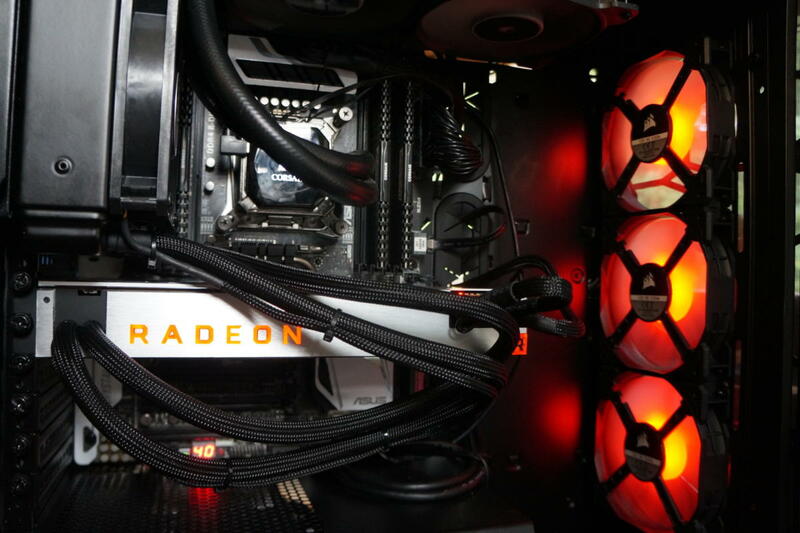 More importantly, the Vega cards use a vapor-chamber cooler that improves upon the basic blower fan of Polaris. 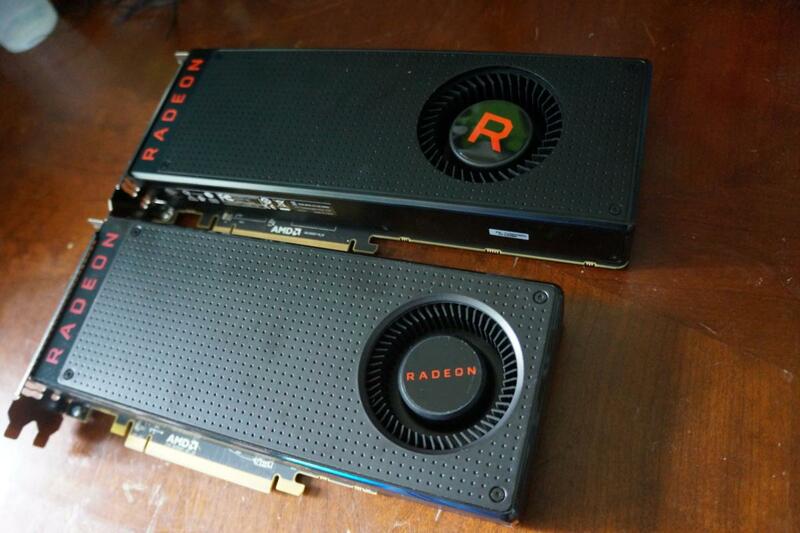 In the photo below, you can compare the Vega 56 (at top) to the Radeon RX 480 reference card (at bottom). We’re also reviewing the liquid-cooled version of the Radeon RX Vega 64. 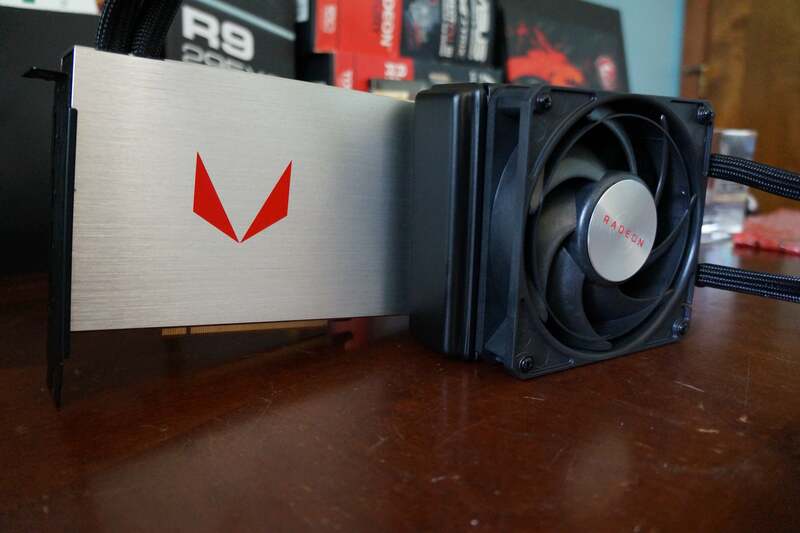 It bears the same brushed-aluminum design as the air-cooled Vega 64 Limited Edition, but ditches the blower-style fan in favor of integrated water-cooling with a 120mm radiator, similar to the Fury X’s design. 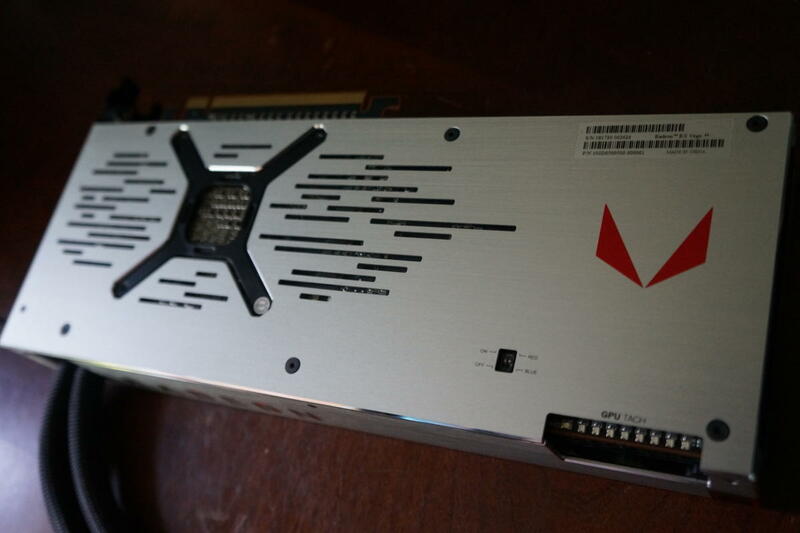 From its stark, unblemished face to that ruby-colored “R” in the corner, the liquid-cooled Vega 64 is gorgeous—so much so that my non-techie wife walked into my office, saw the card in its box, stopped dead in her tracks and gasped, “God, that’s beautiful.” That’s a first. 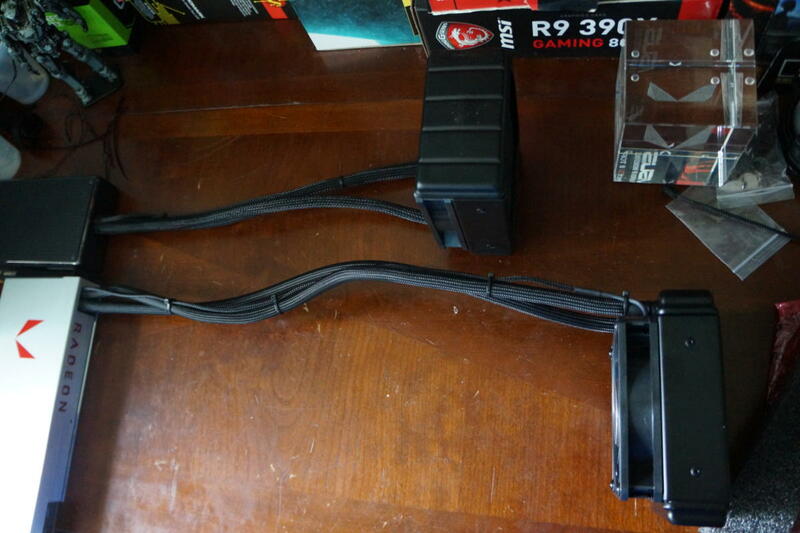 But any points this card gets for attractiveness are offset by the ill-conceived tubing for the liquid-cooling. The older Fury X featured shorter tubing that sprouted from the end of the card, providing just enough length to install its 120mm radiator in the optimal fan spot at the rear of your case. By contrast, the liquid-cooled Vega 64 awkwardly sprouts its tubing from the very front edge of the card, just behind the I/O bracket—and directly underneath where your radiator will likely be installed in your case. That could’ve been okay with short tubing, but Vega 64’s liquid-cooling tubes are actually longer than the Fury X’s (as you see below), yet too short to be able to comfortably route back around the end of the card. The end result? We had to tuck the problematic bundle of liquid-cooling tubes underneath the card. It wasn’t very attractive and would’ve likely caused some headaches if we’d had other PCI-E devices installed in our mid-tower PC case. Longer tubing is handy for installing reservoirs elsewhere in your case, but this design feels like it could be more refined. 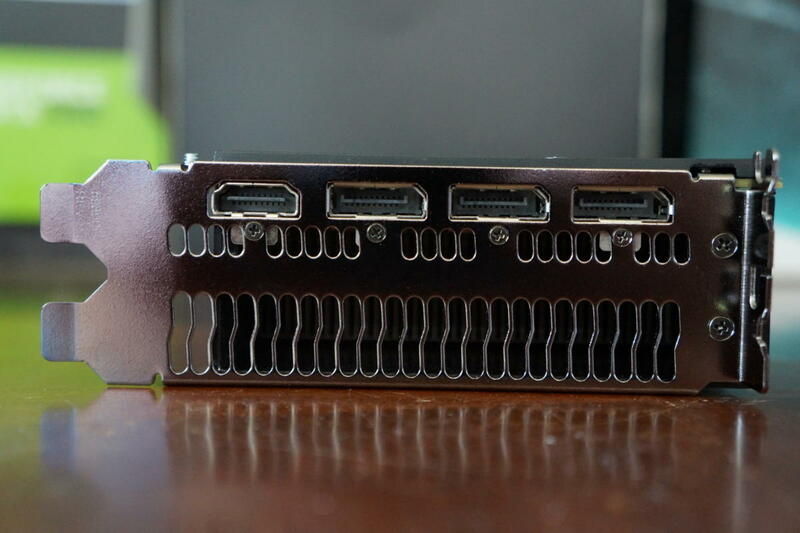 Radeon RX Vega cards include a trio of DisplayPort 1.4-ready outputs and an HDMI 2.0 port. The architecture’s updated display engine can support up to two 4K/120Hz panels, or a trio of 4K/60Hz displays. That’s a whole lot of pixels! And of course, Vega cards support AMD’s FreeSync technology, which eradicates stuttering and screen-tearing on compatible monitors. It’s a major factor in the value proposition that Radeon marketing is pushing for Vega. Both versions of the Radeon RX Vega 64 also sport the nifty “GPU tachometer” feature that debuted with Fury. 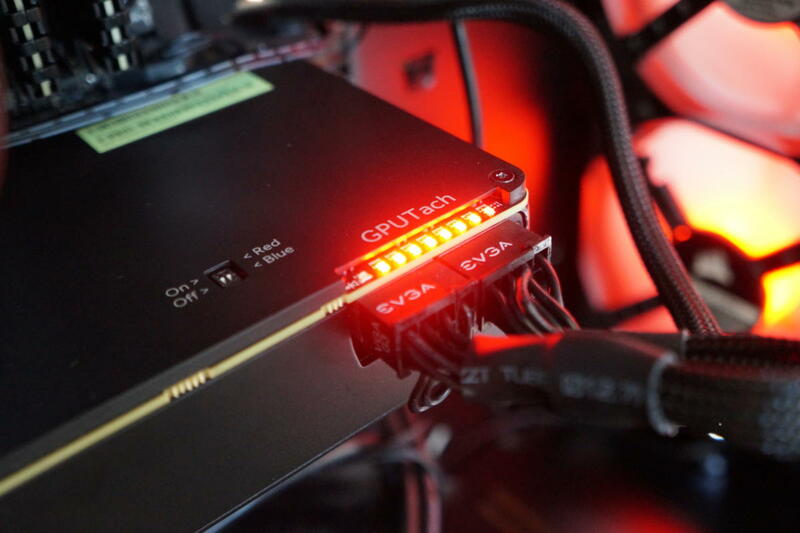 A line of LED lights above the power connectors flash to life correlating with the GPU load. The harder you put the pedal to the metal, the more lights flare up. It’s silly, but I adored it in Fury and I still adore it now. There’s just something satisfying about seeing the GPU tachometer start shining when you boot up a game. AMD's Radeon RX Vega 56 manages to be slightly more powerful than the GeForce GTX 1070 while generating less heat. It's a great option for all gaming except 4K. AMD's Radeon RX Vega 64 is an excellent graphics card for 1440p gaming. It uses a lot more power than rival GeForce GPUs and runs very loud in its reference form, however. The liquid-cooled Radeon RX Vega 64 is gorgeous, but it suffers from design flaws and drastically underperforms for its price tag.